From the app, tap on the menu bar on the left to access the menu. The transaction information will display. Tap Void Order at the top right. Select the Void Reason from the pop-up screen. 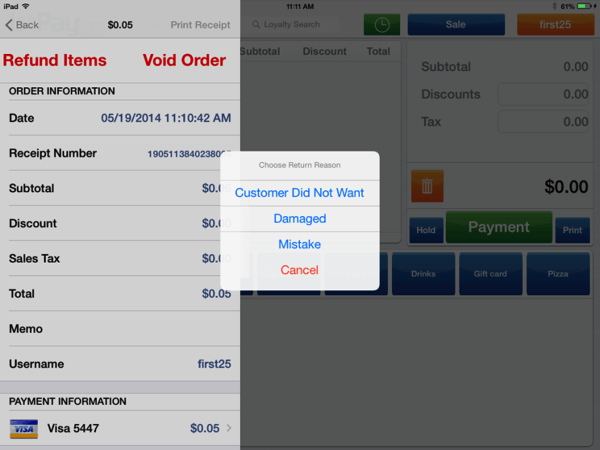 When the void is complete, you will be presented with the option to Print Receipt or close the Void dialog. Select one and the Void will be complete. NOTE: Processing a void would result in cancelling the entire transaction before it is settled and/or incorrectly added to sales totals. For credit card transactions, a void must be done before the transaction is settled. If the transaction has been settled, then a credit/refund would have to be processed for the customer. Select the transaction you'd like to refund. The transaction information will display. Click Refund Items. A screen will display all items from that order. Select the item you wish to return. The merchant will be prompted to enter the quantity being returned. After the quantity is entered, click Next to continue. The merchant will be prompted to select the reason for the return. 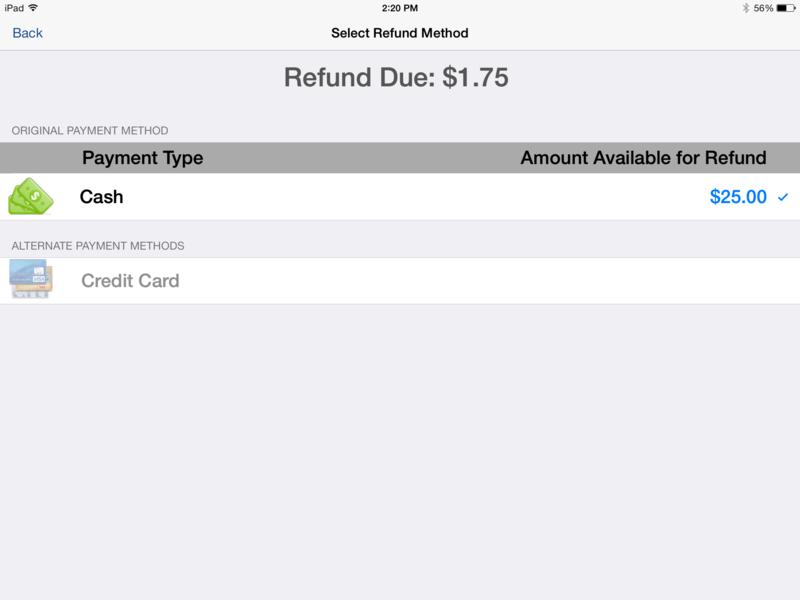 Return reasons are created in the 1stPayPOS Portal. After all of the items to be returned have been selected, click Next. Select how you'd like to issue the refund. Payment Type will show the original form of payment made. Tap that or one of the other available payment methods. If a card payment method is selected, you will be presented with a dialog box asking you to Swipe the Card. Swipe the card, or select Manually Key to type in the card number. When the refund is complete, you will be presented with the options of Print Receipt or Done. Select one and the Refund will be complete. From the Recent Transactions screen, the refund total will be displayed below the sale amount.